A coalition of African-American and civil rights groups is expected to challenge Michigan’s new congressional and legislative district maps approved earlier this year by the Republican-controlled Legislature. The leader of a group of African-American lawmakers say he expects the lawsuit to be filed in federal court by the end of the month. State Representative Fred Durhal chairs the Michigan Legislative Black Caucus. He says the new maps violate voting rights laws. He says that’s because they diminish the voting power of urban minority voters – and the evidence of that is how many Democratic incumbents from minority districts will be forced next year to run against each other. Republican leaders say a court challenge to any redistricting plan is normal, and was entirely expected. GOP leaders say the maps reflect population shifts, and that they were very careful to comply with the law. A lawsuit is the only way to challenge the new political map. A technicality in the law makes it immune to a voter referendum. The 2010 Census figures, released last month, announced that Michigan was the only state in the nation to lose population in the last decade. Now it is up to the states to redraw their congressional districts based on the findings of the Census. Redistricting can play a big role in the political makeup of both state and federal representation. In Michigan, citizens are waiting to see how the Republican-dominated Legislature will handle the task of reshaping the state’s congressional districts. The main objective of redistricting is to create congressional districts with roughly equal populations in each district, says John Chamberlin, Professor of Political Science at the University of Michigan’s Gerald R. Ford School of Public Policy. Each state handles the task of redistricting differently. 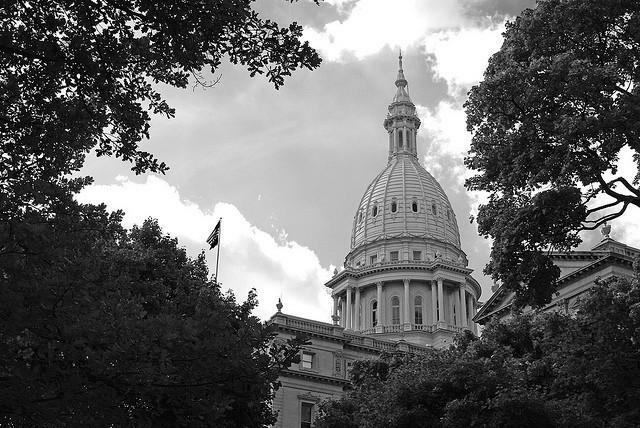 In Michigan, redistricting is treated as legislation, with the Legislature creating a bill for passage by the governor. Because the Republican Party controls the Michigan state Senate, House, and governorship, the task of redistricting will fall solely to the Republicans. Due to the fact that Michigan lost population since the last redistricting took place, the state will lose one member in the U.S. House of Representatives. Through redistricting, the Michigan Legislature must determine where to combine districts in order to eliminate the district of one U.S. Representative, explains Chamberlin. When I was twelve years old, Sander Levin, who everybody calls Sandy, was my state senator. When I was eighteen, he ran for governor. He was elected congressman for the district where I now live when I was thirty years old. Next year, I will be sixty. And Sandy Levin, who turns eighty this summer, will still be representing me in Congress. That’s not to imply that he isn’t still sharp. On the contrary, Levin was chairman of the powerful House Ways and Means committee until Democrats lost control of the House last fall. But he, and the Democrats, have a dilemma. Republicans are entirely in charge of the congressional redistricting process this year. Michigan is losing a seat in Congress, and you know Republicans are going to try to eliminate one of the six seats Democrats hold, not one of the nine held by their party. Everything I know tells me that they are most likely to throw Sandy Levin in a district with Gary Peters, now serving his second term in the House. Levin has far more name recognition and seniority than Peters. If the two men are forced to battle against each other in a primary, he’ll almost certainly be the favorite. Both men also say they are running for re-election, no matter what. But - should Sandy Levin really do this? Might it be better for him - and especially, for his party - if he makes a graceful exit? Here’s why I say that: Most of Michigan’s Democratic delegation in the House of Representatives are old. Really old. Next year, John Dingell will be eighty-six. Dale Kildee and John Conyers, eighty-three, Levin, eighty-one. The only exceptions are the just-elected Hansen Clarke of Detroit, who will be fifty-five, and Peters, fifty-three. Does it make sense for the state and the party to sacrifice the career of the fifty-three year old so the guy more than old enough to be his father can have another term? Within a very few years, all of those lions are going to be gone, one way or another. Does it make sense to lose all our experience pretty much at once? "We're seeing the population density that was once more concentrated in southeast Michigan is moving broader across the state. I think Michigan has been thought of traditionally as a one-city state. I think we're seeing that is no longer the case." McCann says the Legislature's GOP leaders would like to have the new district maps adopted and sent to Gov. Rick Snyder before July 1st. That's the beginning of the Legislature's summer break. State Rep. Barb Byrum (D-67th) says that time frame is too fast. There are so many problems with these maps, they’re so unfair, outrageous that I trust it will be challenged in court. Voters should be able to choose their members of Congress and what this map does is allow incumbent Republicans to choose their voters, and so I think it’s exactly backwards. Two U.S. Representatives from Michigan, Sander Levin (D-12th) and Gary Peters (D-9th), say the Michigan House Republicans gerrymandered their districts. 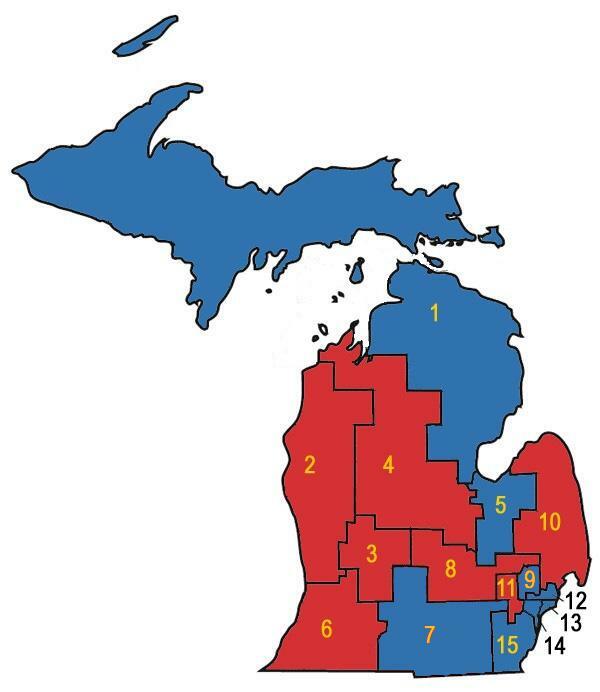 Michigan House Republicans released their proposed map for Michigan's Congressional districts this afternoon. Because the state lost population, Michigan had to lose one seat in the U.S. House of Representatives. The Republicans are in control of the redistricting process and they chose to eliminate a district by moving Rep. Sander Levin into the district now held by Rep. Gary Peters. Levin and Peters released a joint statement regarding the proposed map and are holding a press conference at 3 p.m.
“Voters in Michigan have never before faced such a shamelessly partisan redrawing of congressional boundaries. Instead of drawing fair lines that follow community and county borders in a logical way, the Republican legislature has drafted a map so skewed that it exploits every trick in the book to gerrymander districts in ways that benefit Republican incumbents. The Legislature and Gov. Snyder should reject this gerrymandered map and draw congressional boundaries in a way that puts Michigan voters’ interests squarely ahead of flagrant partisan advantage." Republicans in the Michigan Legislature have released their proposed maps for new Michigan House and Senate districts, and new districts for the U.S. House of Representatives. You can scroll through before and after maps in the images above. The Michigan Public Radio Network's Rick Pluta points out that approval of these maps is like approval of a bill. Both the Michigan House and Senate will have to approve them, and then Gov. Snyder will have to sign off on them. The maps also have to adhere to state and federal laws and preserve two of Michigan's majority-minority districts for the U.S. House of Representatives. Because of the loss in population in Michigan, the state will lose one seat in the U.S. House of Representatives - going from 15 representatives to 14. As expected, the proposed districts would move U.S. Rep. Sander Levin (D-Royal Oak), into the district now held by U.S. Rep. Gary Peters (D-Bloomfield Township) meaning if they both wanted to keep their seat in the U.S. House, the would have to run against each other in the Democratic primary.